If you’re planning to spend three weeks in Bali, then let me start off by saying I support that. Bali is one of my favorite places in the entire world, and in my opinion, three weeks is the perfect amount of time to explore the island, get to know its rich culture and friendly people, as well as its lush lands and delicious cuisine. Between Bali’s thriving coastal reefs, active volcanoes, fascinating culture, dense jungles, abundant wildlife, black-sand beaches, and mouthwatering food, there is so much to discover in Bali. If it were up to me, I would move to Bali and stay there a long while. After our recent three-week trip to Bali, I left with an even longer list of things I want to see and do when I come back. Even though, geographically, Bali is a small island, the list of things you can see, do, and experience in Bali is endless. In fact, I believe Bali has more to offer than any other destination I’ve experienced. Simply put, Bali is a paradise island with everything you could ever want or need out of a trip — culture, the kindest locals in the world, adventure, fantastic food, beaches, mountains, great weather, beautiful scenery. Seriously, I could go on and on. In short, if you’re wondering whether three weeks is too long to spend in Bali, the answer is no. Three weeks is a perfect introduction to Bali; but I promise, you will leave wanting more, wanting to come back as soon as possible! 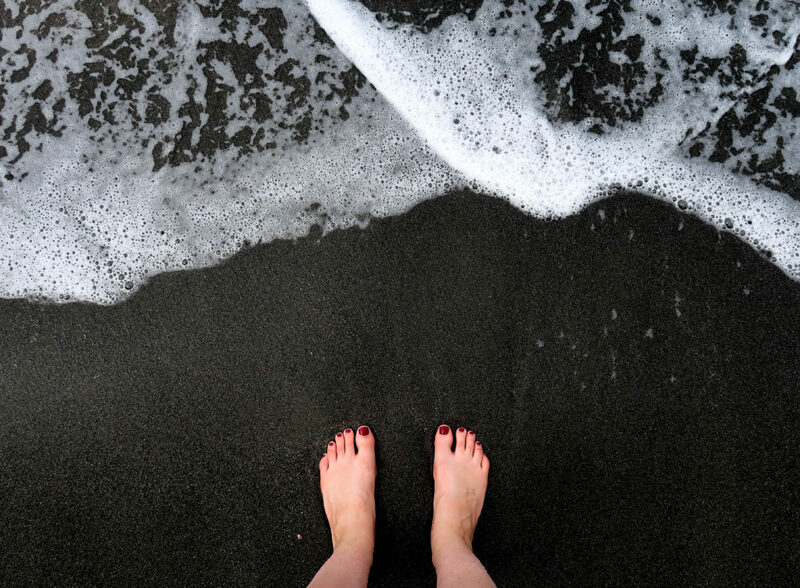 Read on for the ultimate guide to three weeks in Bali! When you travel anywhere, but especially to a third-world country like Indonesia, you should have travel insurance. 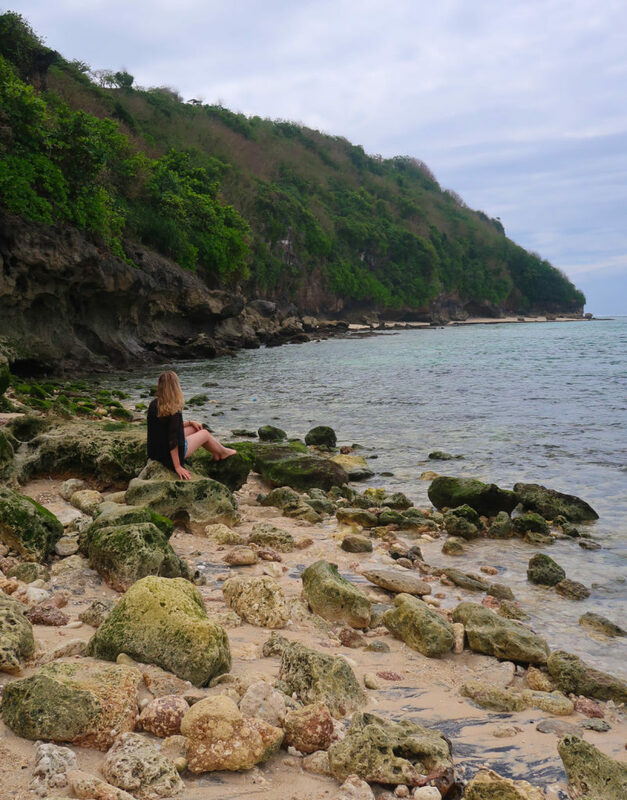 So many things can go wrong when you travel to Bali, from injuries doing adventurous activities like rafting, snorkeling, and hiking, to sicknesses from food, bug and animal bites, and more. Not to mention, your trip could be cancelled or delayed for any reason. Or your airline could lose your luggage or your belongings could be stolen. 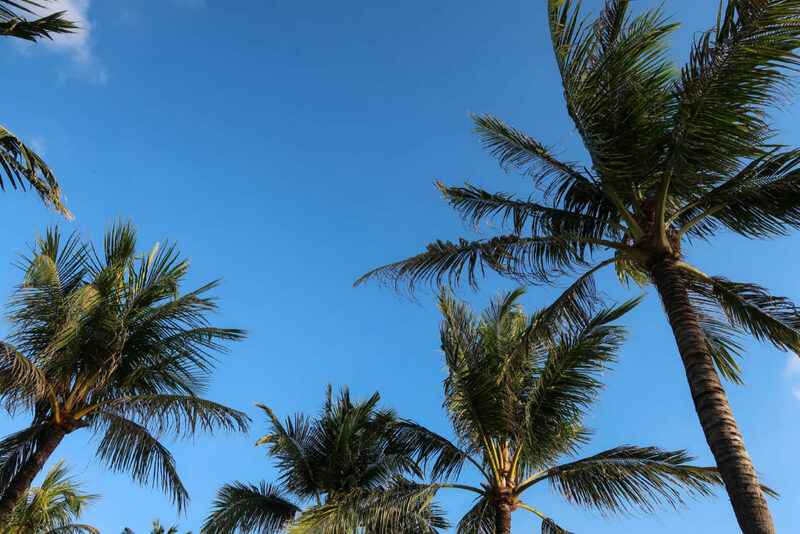 For all of these reasons and more, you should make sure that you have travel insurance before booking your trip to Bali. If you don’t, and something happens, you will be so sorry. Click here for an instant travel insurance quote for your trip! If you have never visited Asia before, then there is a good chance that you may need to get some vaccinations, such as Hepatitis A and Typhoid, before you go. Your doctor may also prescribe you preventative malaria pills, as well as pills for traveler’s diarrhea. Make sure to visit with your doctor a few weeks before you plan to travel to Bali to find out what you need. 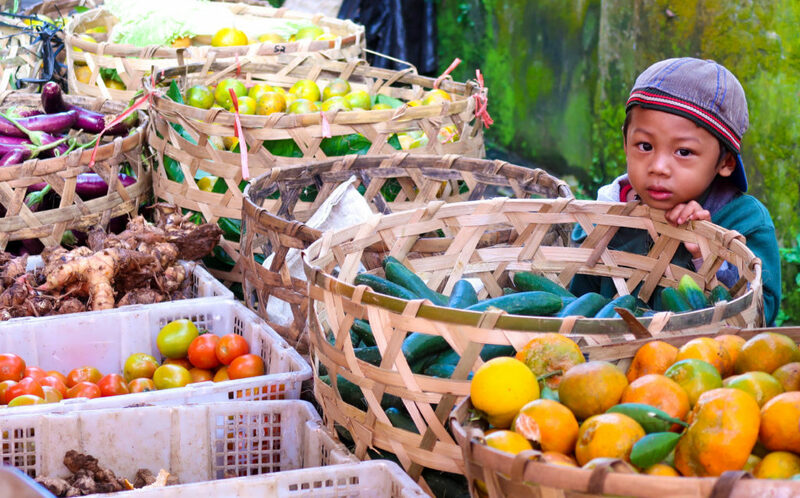 Ubud is the cultural heart of Bali, and as such, it deserves one week of your time! 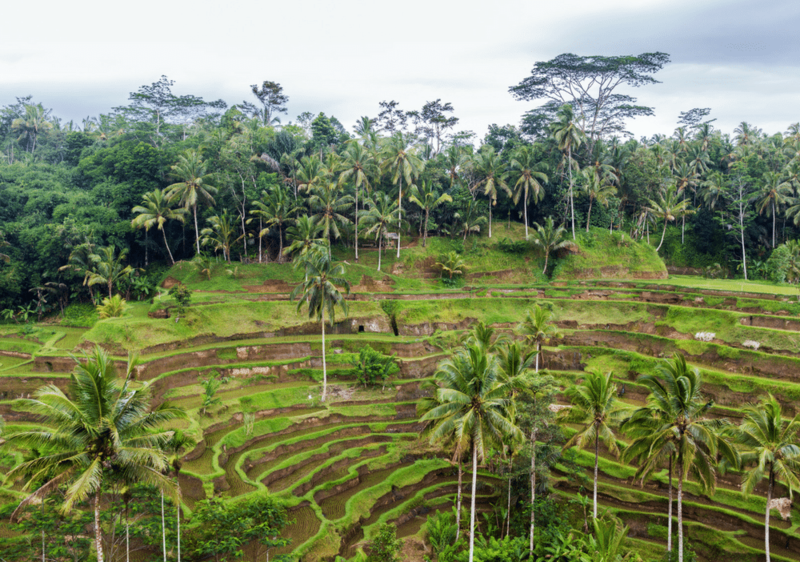 There are so many things to discover in Ubud — culturally, spiritually, and outdoors. Culture-wise, you can learn about traditional wood-carving techniques and also how the Balinese create and give offerings to their gods, watch a traditional fire dance, take a cooking class, see typical art, and much more. Ubud is also set in the middle of dense forest, with rivers running through all parts of the area. The lush greenery, endless wildlife, and rice terraces make Ubud one of the most beautiful areas of the island. The outdoors offer so may opportunities for things like exploring waterfalls, white-water rafting, biking through the rice fields, nature walks, and more. You can also expect to find thousands of temples, dozens of yoga houses, plenty of spas, and vegan restaurants throughout the city. In general, the best and safest way to get around Bali is to hire a private driver. Arrange for your driver to wait for you at the airport when you arrive. From the airport to Ubud, it’s roughly an hour to 1.5-hour drive, depending on traffic (there is always traffic in Bali). Alternatives to this would be to have your hotel arrange a shuttle for you (if applicable) or rent a scooter and drive yourself (if you don’t have plenty of scooter experience, then this is not recommended). There are many places you can stay in Ubud, which range in price and class. In general, I recommend choosing a nicer place than you’d usually stay in, since Bali offers such great value for your money. 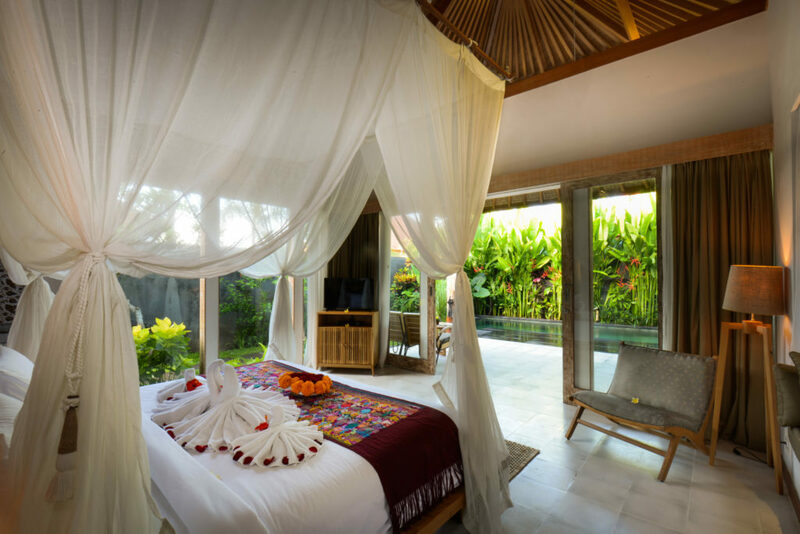 By far, my favorite place to stay in Ubud is the Purana Boutique Resort. This 4-star resort is located in a quiet corner of Ubud, far away from the hustle and bustle. The staff also treat you like family and really get to know you. The service is incredible. And on top of all that, the food is some of the best hotel food we’ve encountered. You can book your stay at the Purana here! My two other recommendations for 5-star resorts in Ubud would be the Maya Ubud Resort & Spa and also the Kamandalu Ubud. Both resorts are absolutely incredible, so if you have room in your budget, I would highly recommend booking a private pool villa at either one of these resorts. 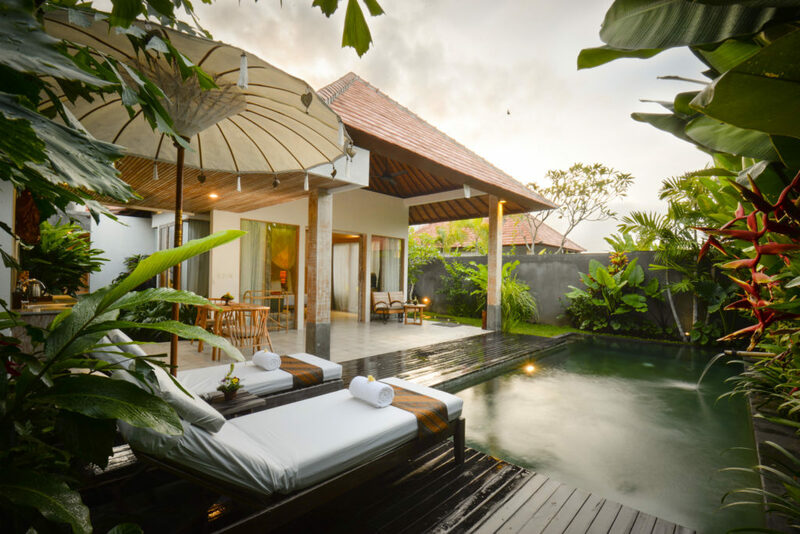 You can find other great deals on accommodations in Ubud here! There are so many amazing things to do during your week in Ubud, so wrote an entire post about it! See our Guide to One Week in Ubud for more information. In Ubud, there are an abundance of incredible plant-based, vegetarian, and vegan restaurants. There is such an emphasis on health and well-being in Ubud that, even if you don’t usually eat this healthily, you should give it a try in Ubud. Nowhere in the world is healthy food so incredibly delicious. See our Ubud Foodie Guide for more! 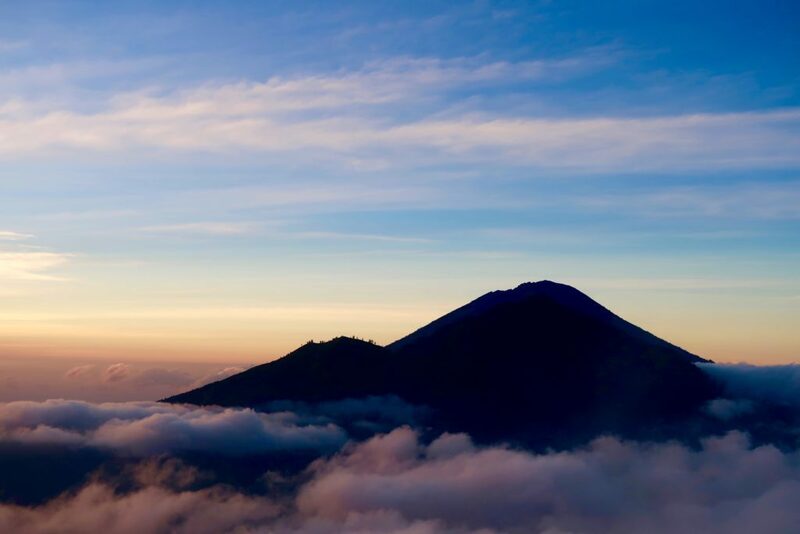 Hiking Bali’s Mount Batur at Sunrise: A MUST-DO! Pemuteran is a small fishing village on the North Coast of Bali which most visitors to Bali have never even heard of, let alone visited. 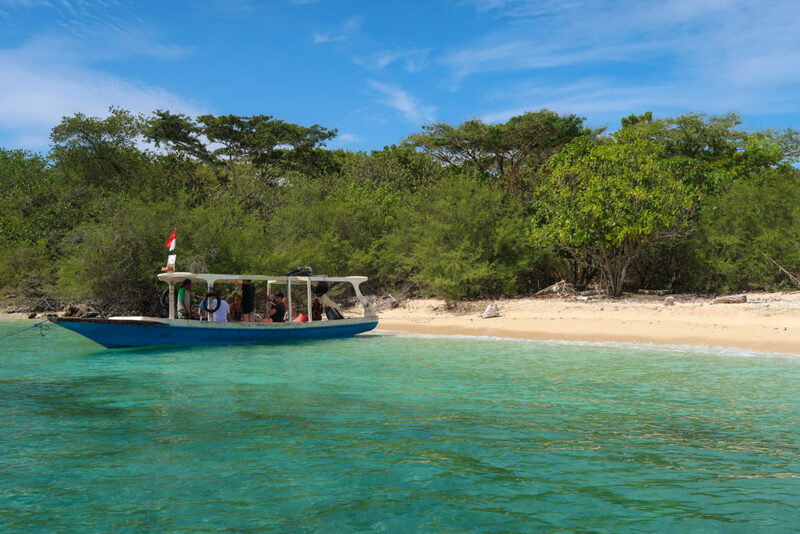 Nearby Menjangan Island and the Biorock Project offer some of the best snorkeling and diving opportunities in Bali, meanwhile Pemuteran’s beaches and the West Bali National Park offer both adventure and relaxation. In addition, the traditional Balinese food and seafood in Pemuteran is so, so good! 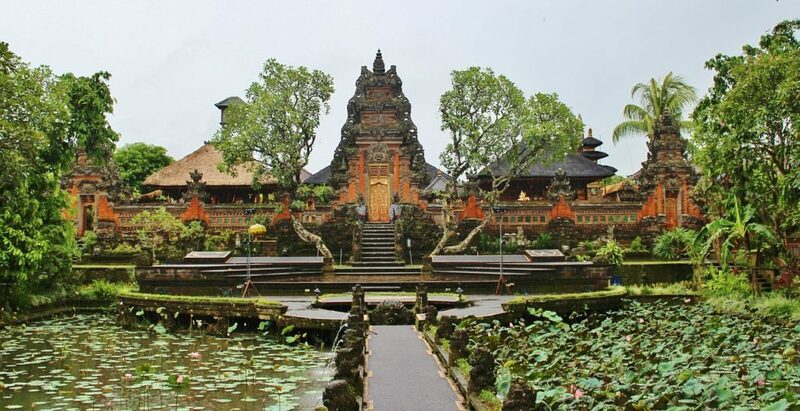 From Ubud, have your private driver take you to Pemuteran. 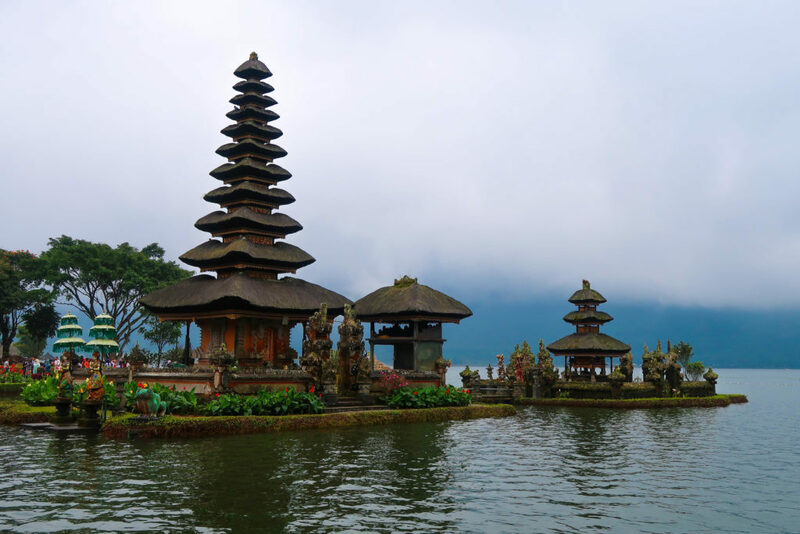 The drive is about three to four hours, depending on traffic, however, you will likely want to make plenty of stops at all of the beautiful places along the way, such as Ulun Danu Bratan Temple and the Jatiluwih Rice Terraces. Our favorite place to stay in Pemuteran is definitely the Global Royal Pemuteran. I’m confident that you won’t find a more adorable six-villa resort in Pemuteran — or anywhere else in the world, for that matter. To this day, our stay at the Global Royal Pemuteran has been one of our favorite hotel stays because of its welcoming staff, lovely villas and pool area, and the overwhelming tranquility of the place. You can book your stay at the Global Royal Pemuteran here. You can find other great deals on accommodations in Pemuteran here. When it comes to things to do in Pemuteran, there are two options: either adventure or pure relaxation. Between snorkeling, diving, swimming, paddle baording, and hiking there are plenty of outdoorsy things to do. Then on the other side of the spectrum, you could also laze away your days at your resort pool, on the black sand, or at the spa! 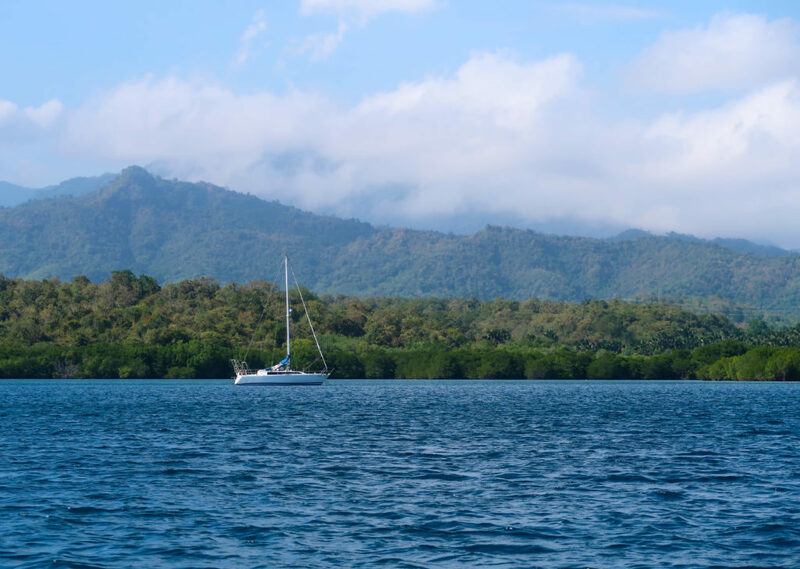 Click here for our complete guide to Pemuteran, with more information on what to see and do. Like we said before, the food in Pemuteran is fantastic — which was a happy surprise for us, considering how tiny, remote, and unknown this little town is. Another plus is that all of the restaurants are very reasonably priced (cheap)! Click here for our in-depth guide to Pemuteran, including all of our restaurant recommendations! 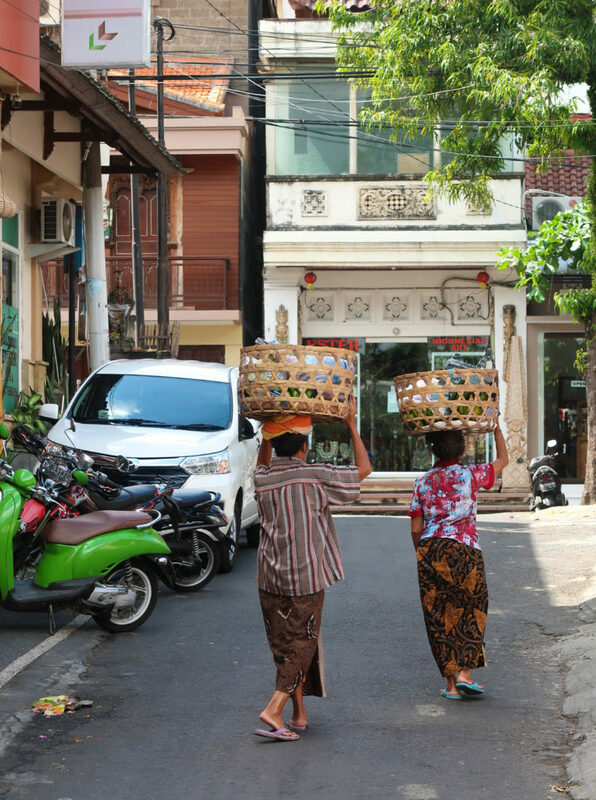 Located in Bali’s busy south is a haven for foodies, shoppers, and beach-goers. Seminyak is an upscale, trendy area of Bali, which is absolutely worth visiting for a few days. If you’re into food, then you will love experiencing Seminyak’s world-class dining scene. The area also offers some of the best shopping in Bali — that is, if you’re interested in pricier (but super chic) boutiques. 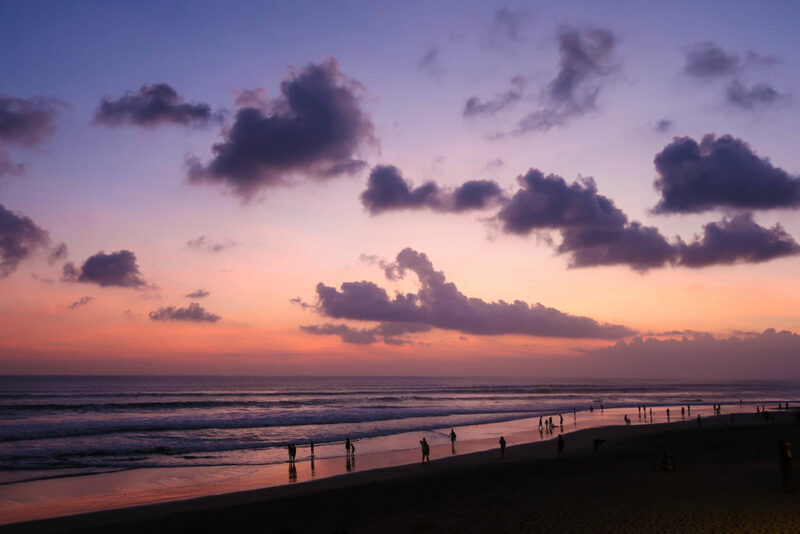 Part of Seminyak lines Bali’s west coast, so there are also some awesome beaches to explore and beachfront resorts to stay at. You will also find plenty of nightlife in Seminyak, which tends to be a lot classier than in neighboring Kuta. And speaking of neighbors, staying in Seminyak also allows for the opportunity to explore places like quiet Canggu and party-central Kuta. There are a few routes you could take from Pemuteran (in the north) to Seminyak (in the south); however, we recommend asking your driver to take you down Bali’s entire West Coast. It’s about a four-and-a-half-hour drive, but this way, you will see a new part of the island that most visitors never see! You will get a chance to stop at important places such as Tanah Lot and serene beaches, jungles, and rice terraces. In Seminyak, we stayed at the Amadea Resort & Villas. This resort is located in the very center of Seminyak, which was perfect because we were nearby all of the action. This hotel is tucked back off of the main street, though, so there is no noise! It’s also roughly a 15-minute walk to the beach and all of the nice beach resorts. You can book your stay at the Amadea Resort & Villas here! While in Seminyak, we stopped over to the beachfront Samaya Seminyak to have a few drinks and appetizers. If you want a luxury beach resort experience in Seminyak, we highly recommend staying here. The premises and service were both superb and you absolutely cannot beat the beach location and gorgeous sunset views. You can find other great deals on accommodations in Seminyak here! Eat amazing food. Shop at the boutiques. Hit the pool. Relax a bit. Hang at the beach. Go to the bar for a fancy cocktail or two. As we mentioned, Seminyak is the mecca of upscale eating in Bali. 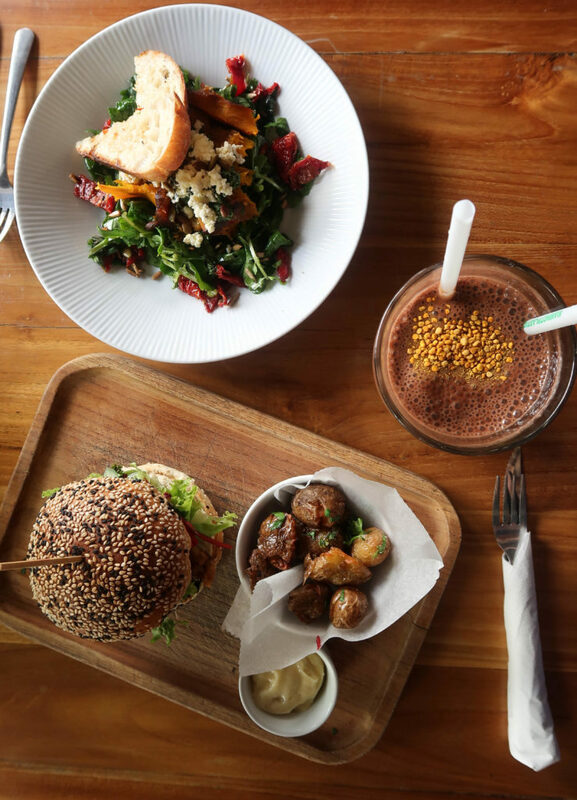 If you’re looking for a vegan cafe, a place with kickass acai bowls, a fine-dining experience, or international cuisine, you can find it in Seminyak. Nusa Penida is an island just off Bali’s southeast coast, which has not yet been introduced to mass tourism. Just a quick 30-minute ferry ride away from Bali, you will immerse yourself in the incredible, untouched beauty of Nusa Penida. 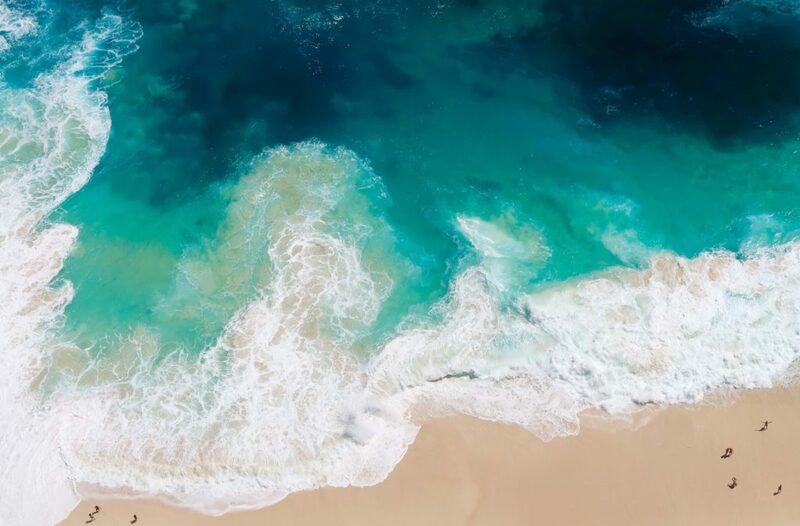 You will gawk at some of the most beautiful natural scenes you may ever see, swim in some of the clearest blue water, and even snorkel with giant manta rays. Hurry! Make sure you visit Nusa Penida during this trip, because as more people find out about it, the island will lose its wild charm. From Bali’s Sanur Harbour, it’s very quick and easy to reach Nusa Penida by ferry. Our guide to Nusa Penida includes detailed information on how to get to Nusa Penida by ferry. Click here to see it. There aren’t many places to stay on the island of Nusa Penida since it is not yet a tourist hot spot. 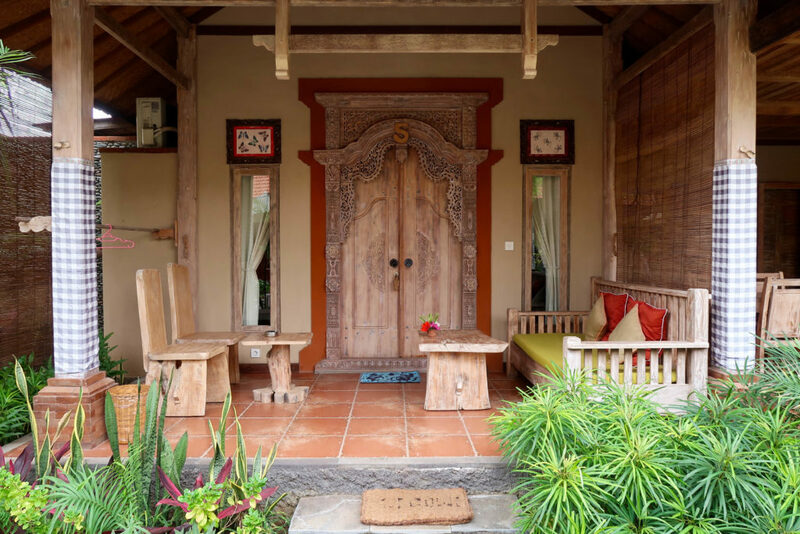 Without doubt, the Kubu Ganesh Guesthouse is the best place to stay on Nusa Penida! Located on the beach, in a quiet, local area of the island, this guesthouse offers the perfect balance of adventure and relaxation. Not to mention, the service, food, guest rooms, and ocean views are all stellar. 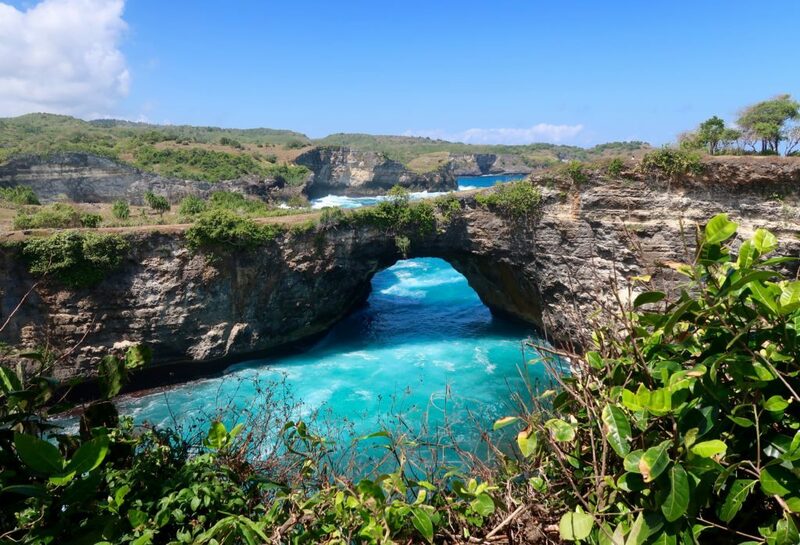 But if the Kubu Ganesh Guesthouse is full during your visit to Nusa Penida, then two other great options are the Jati Bugalows and the Kulkul Bungalow. Both of these bungalows offer convenient locations on the beach, great service, and super high ratings! From snorkeling and diving, to hiking, riding scooters, visiting temples, and hanging around at the beach, there is so much to do on Nusa Penida. 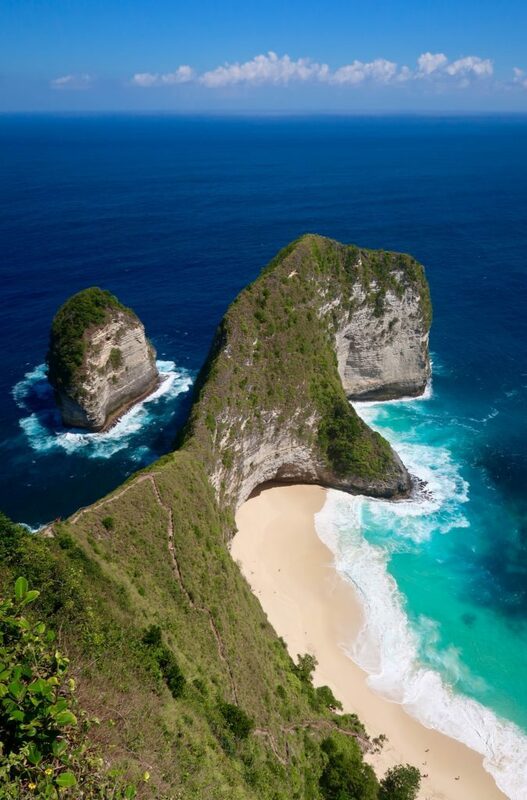 See our guide to Nusa Penida for more information on what to see and do. 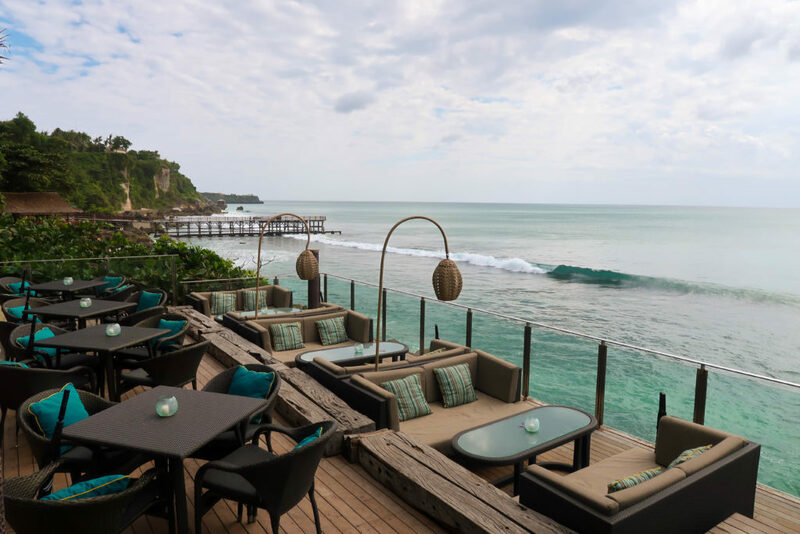 Some call Jimbaran the Beverly Hills of Bali, and they are not wrong! This upscale beach area of Bali is home to some of the island’s most beautiful beaches, as well as the island’s best beachfront resorts. It’s also known for some of the freshest seafood on the island, which is caught daily and served up on your table on the sand. In other words, Jimbaran is the perfect place to end a trip to Bali. Think of white-sand beaches, ultra-comfy guest suites with ocean views, relaxing spa experiences, ice-cold craft cocktails, delicious seafood, pure relaxation and enjoyment. 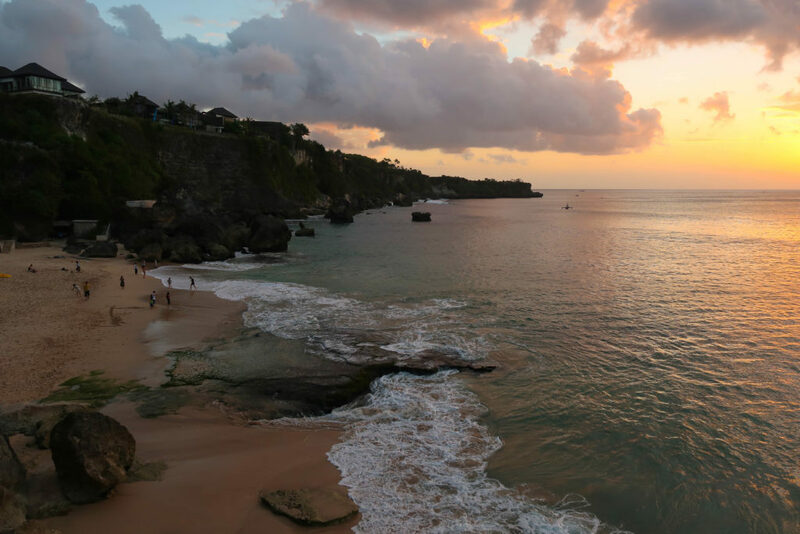 Jimbaran is also next to Uluwatu, which means you’ll be able to stay in Jimbaran, but have the opportunity to explore everything Uluwatu has to offer (and there is much to discover in Uluwatu). 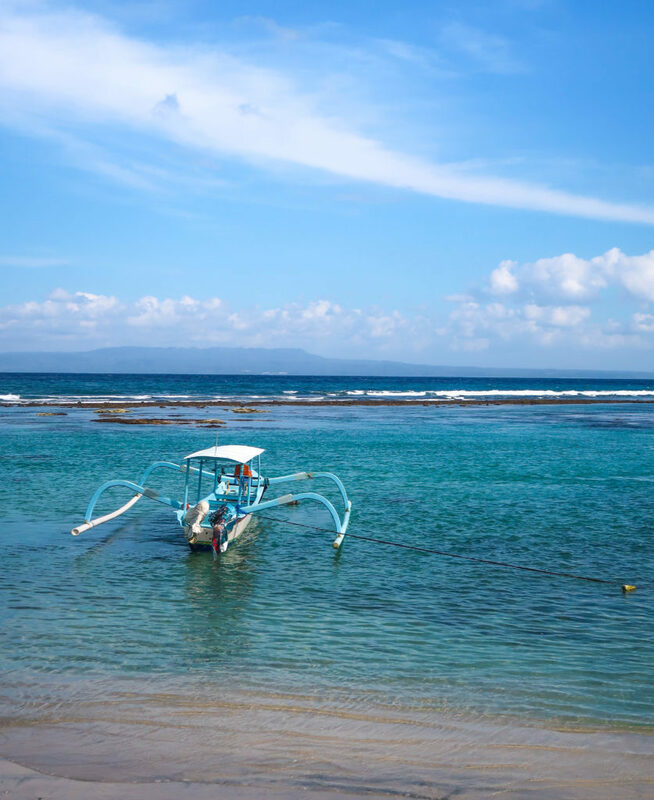 Once you arrive back in Bali at the Sanur Harbour, have your private driver pick you up and drive you to Jimbaran, which is roughly a 30-minute drive. In no time, you’ll be in Jimbaran and ready to wrap up your trip in style. To wrap up our three weeks in Bali, we stayed at the beautiful AYANA Resort and Spa, Bali. We recommend you do the same. While the AYANA does have a high price point, it’s so worth it to pamper yourself and relax by the beach after 2.5 weeks of non-stop adventure. We loved the AYANA Resort and Spa, Bali for so many reasons. For starters, it’s located on a very large cliff overlooking the Indian Ocean, so the views are absolutely to-die-for. The service deserves at least five stars. The many restaurants throughout the resort are all great. The grounds of the hotel are stunning. And the resort is also home to the legendary Rock Bar, which everyone knows is the place to be. There really is no better place to relax and soak up your last few days on the Island of the Gods. You can book your stay at the AYANA Resort and Spa, Bali here. You can also find other great deals on Jimbaran accommodations here. In Jimbaran, your main goal should simply be to enjoy everything your resort has to offer. You deserve a bit of relaxation, don’t you? However, you should also spend at least one day outside of the resort, exploring Uluwatu. Between all of the legendary surfer beaches, like Padang Padang and Suluban, the cliffside Uluwatu Temple, unknown beaches like Green Bowl Beach, and dirt-cheap spa treatments, there are so many things to do in Uluwatu. Make sure to hire a driver for an entire day (this should cost roughly $50) to take you around to all of the places you want to explore. If you stay at a place like AYANA Resort and Spa, Bali, then you won’t find yourself leaving the resort much to eat. Because the food there is already so good! However, there is one dining experience you must have in Jimbaran! Go to Jimbaran Bay and have a seafood feast at one of the restaurants (just pick the busiest one) on the sand as the sun sets. You should order a giant platter of all different types of seafood, drink a few Bintangs, and enjoy a beautiful sunset. This entire experience won’t cost more than $40 per person! It’s absolutely incredible. 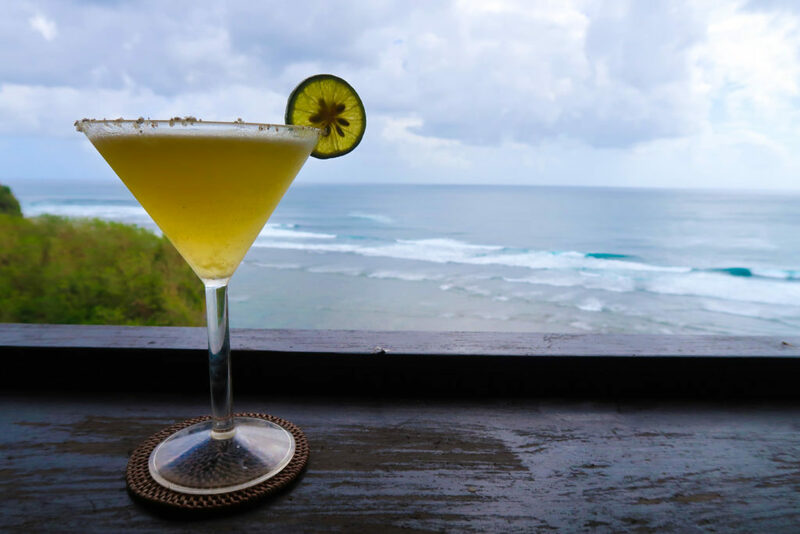 If you want to eat out in Uluwatu, then we can’t recommend Single Fin enough. The vibes, the views of endless waves, awesome cocktails, and bomb food are a few reasons why. We also highly recommend Smoothie Shop and Ayu’s Food from the Heart! So you want to know how much it costs to spend three weeks in Bali? Well, the truth is, there’s no easy answer to that question because everyone’s budget and travel style is different! However, I can tell you how much we spent, what we spent our money on, and what factored into our decisions in doing so. During our three weeks in Bali, one of our main goals was to eat all of the delicious food we could. We sought out the best places we could find, whether that meant local warungs, trendy cafes, or resort restaurants and bars. We also usually enjoyed ice-cold Bintangs, creative cocktails, lattes and teas, or wine with each meal. We hired the same private driver for our entire trip. Here was our route: Airport » Ubud » Pemuteran (with stops for sightseeing) » Seminyak » Jimbaran » Airport. Note that this number is on the high end, and you could definitely negotiate a cheaper price. Below is a list of each of the paid activities we experienced during three weeks in Bali. During three weeks in Bali, we spent a total of $4,379 (or $2,189 per person), but keep in mind that we were not adhering to any sort of budget. We chose where to stay based on reasonable prices and fantastic reviews of customer service, guest suites, food, and location. We booked all of the activities we wanted to experience, no matter the price. We hired a private driver for major transportation, bartered for awesome souvenirs, and took taxis when walking was too inconvenient. And since food is very important to us, we also didn’t skimp on our dining experiences. We ate where we pleased, whenever we pleased, and we ate a lot. $2,189 per person is on the high end of spending three weeks in Bali — though you could do it way more luxuriously than we did and spend a lot more. However, if you’re on a tight budget, you could easily spend three weeks in Bali for about $600 per person. To accomplish this, you would stay in hostels or homestays that include breakfast, and eat street food for lunch and dinner. Then you would decide if there are any activities you can’t miss, and splurge on those. You would also forego spa treatments and souvenir shopping completely. Essentially, spending three weeks in Bali can be as cheap or as luxurious as you want it to be. It’s simply up to you, your budget, and your style of travel! 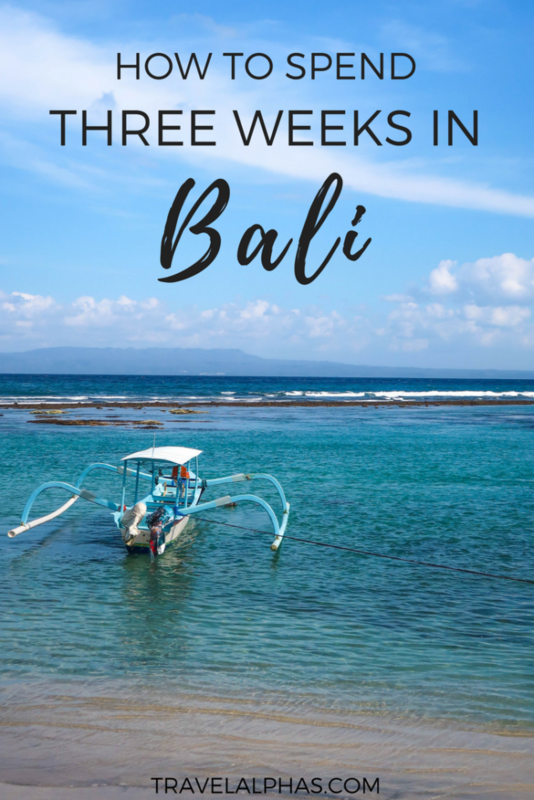 If you’re planning to spend three weeks in Bali, then this is the ultimate itinerary! 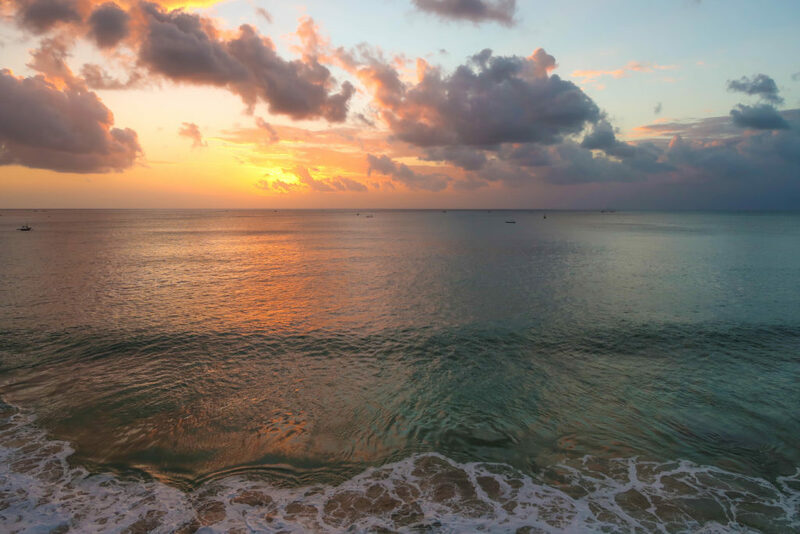 If you want to experience the best of everything that Bali has to offer — nature, culture, food, beaches, outdoor activities, and luxurious accommodations — and get off the beaten path, then this is the guide for you. 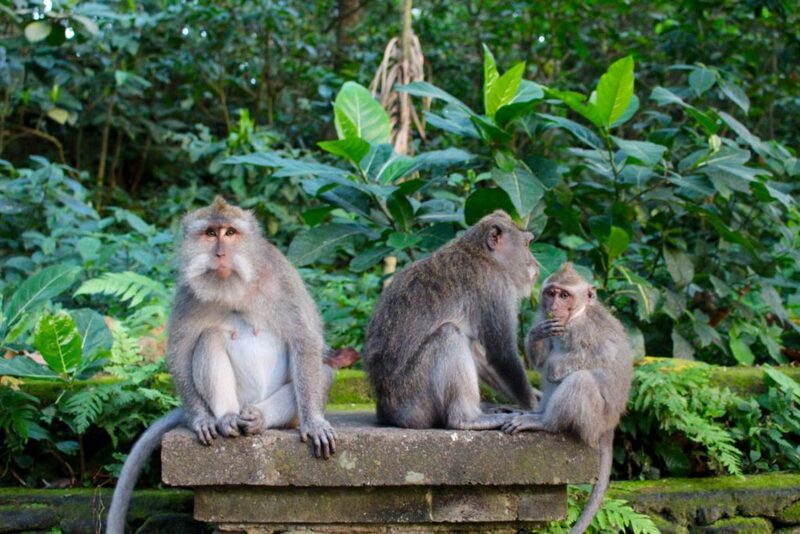 Have you spent three weeks in Bali, Indonesia before? If so, how did your itinerary differ from ours? If you’re planning to spend three weeks in Bali and have any questions, feel free to leave them below! This post contains affiliate links. If you make a purchase through any of the links on our website, we will receive a commission, at no extra cost to you. These commissions help keep Travel Alphas up and running, and we thank you for your support! Please see our disclosure for more information. I became low-key obsessed with visiting Bali after I saw “Eat, Pray, Love” for the first time (love that movie!). One day I’ll have to visit, but until then all your blog posts will tide me over.